From the award-winning, bestselling Mac Barnett and Renata Liwska comes a classic and luminous book perfect for fans of The Quiet Book by Deborah Underwood and Waiting by Kevin Henkes. Sometimes the best children’s books give you more feelings than words when you turn the pages with your child, and Places to Be, is a perfect example. It’s a simple story about two bear siblings that spend their day together. They have lots of places to go and many things to do. As a parent, this reminds me of many weekend days that my two girls spend together and it makes me happy to read and see the lovely pictures. This adorable children’s book is reminiscent of the classics that celebrates all of our wide-ranging emotions. Wonderful and light book to read before bed or when you have some quiet time you are spending with your child. Love! 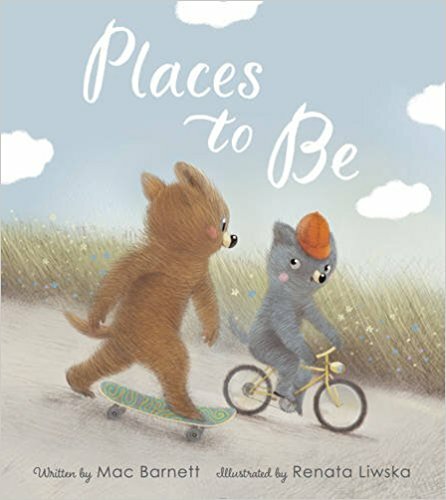 About the Author: Mac Barnett is the New York Times bestselling author of many picture books, including Extra Yarn and Sam & Dave Dig a Hole, both illustrated by Jon Klassen and both Caldecott Honor Award winners. He is also the author of The Magic Word, illustrated by Elise Parsley, and the bestselling Terrible Two series with Jory John. Mac lives in Berkeley, California. You can visit him online at www.macbarnett.com. About the Illustrator: Renata Liwska grew up in Warsaw, Poland, and now lives in Calgary, Canada. She is the illustrator of The Quiet Book and The Loud Book!, both written by Deborah Underwood and both New York Times bestsellers, and Places to Be, written by Mac Barnett. For The Quiet Book, Renata Liwska was awarded the 2010 Society of Illustrators Gold Medal and was named a 2010 Governor General’s Award finalist. You can visit her online at www.renataliwska.com.